Starting an adventure on your own doorstep is something very exciting. With my Via Regia project I was able to do just that. 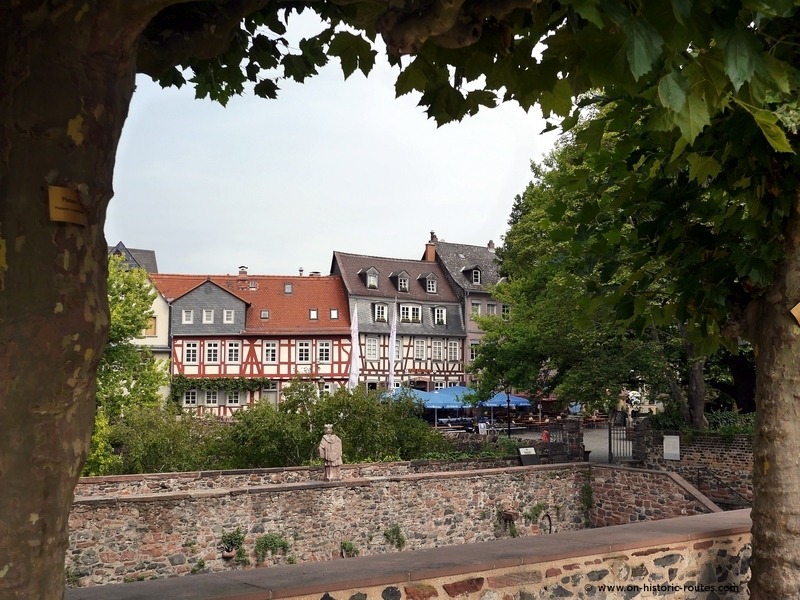 As a warm-up to the Frankfurt to Leipzig route, I walked through the Rhine-Main agglomeration from Mainz to Frankfurt in search of an old long-distance trade route. Street names often have a bit of history attached. This picture was taken about half way between Mainz and Frankfurt. Mainz and Frankfurt are both cities with a long history. Mainz on the river Rhine was a traditional center of power. It was the seat of the Prince Bishop, who for centuries was Chancellor of the Holy Roman Empire. During Roman times, a bridge crossed the river and in the during medieval and early-modern ferries and pontoon bridges serviced this important crossing. Frankfurt has its strategic location built into its name. 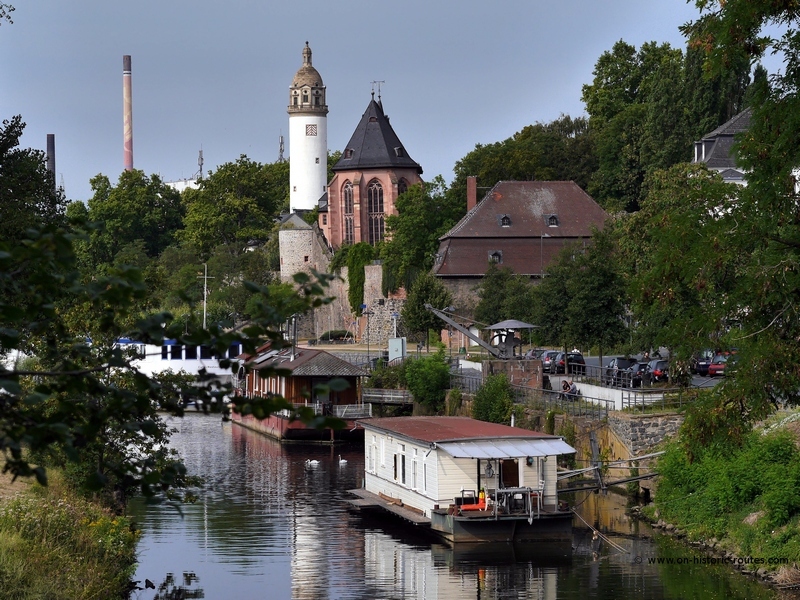 It translated to “Ford of the Franks” and refers to the crossing of the River Main some 40 kilometers upriver from Mainz. In the 11th century, a bridge across the ford was built. This Old Bridge still stand today and is among the main reasons that Frankfurt developed into a trading town with one of the biggest fairs in Germany. Still today, the trade fair (which hosts the Frankfurt Book Fair, and the International Automobile Fair among others) together with the stock exchange and the large banking sector are testament to the history of Frankfurt’s trading history. Once you live in an area for a while, you might think that you know it fairly well. You know places and you know your way around. The routes to get from one place to another will probably depend on your mode of transport. You know certain roads for driving, ways for walking and maybe also cycle paths. In the densely populated area between Frankfurt, Mainz and Wiesbaden, I learned all these specialized routes for driving, cycling, walking and their connections to public transport. However, when I started walking along the Via Regia, all these dedicated routes became mixed up. This really made the walk through an area I knew pretty well into a whole new adventure. View across the vineyards toward Hochheim. Modern infrastructure like power lines is never far away. The route from the old crossing of the Rhine river in Mainz to Frankfurt is pretty straight forward. It runs few kilometers north of the river Main on high ground. 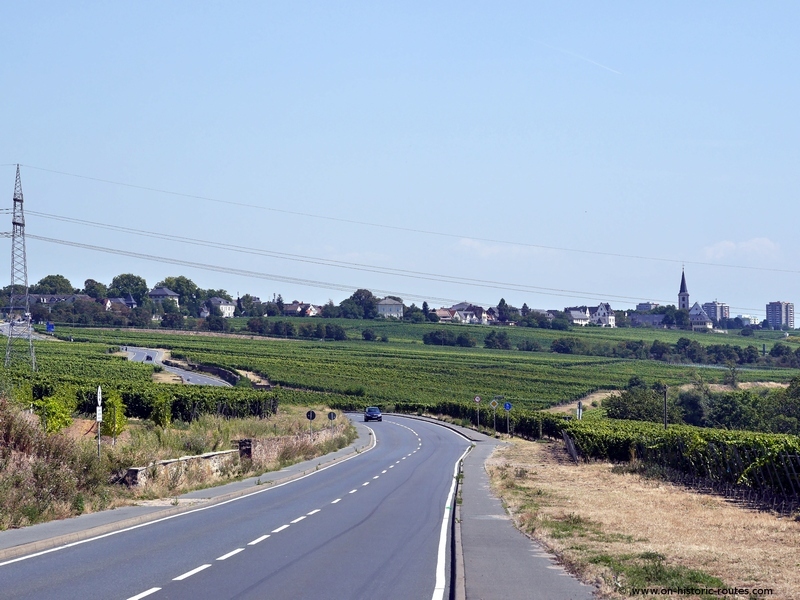 The three old villages of Hochheim, Hattersheim and Hoechst plot the route leaving easy to follow chunks of about ten kilometers between them. These however, are mostly modern roads that I’ve used with my car before. The idea of walking there must have died a few decades ago. Since the historic centers of the villages along the way are not suitable for modern traffic, I have never see them when driving. Walking the old Mainz to Frankfurt route therefore was great, because I could see the modern road in a new light as well as exploring an old town like Hoechst that I did not visit before. 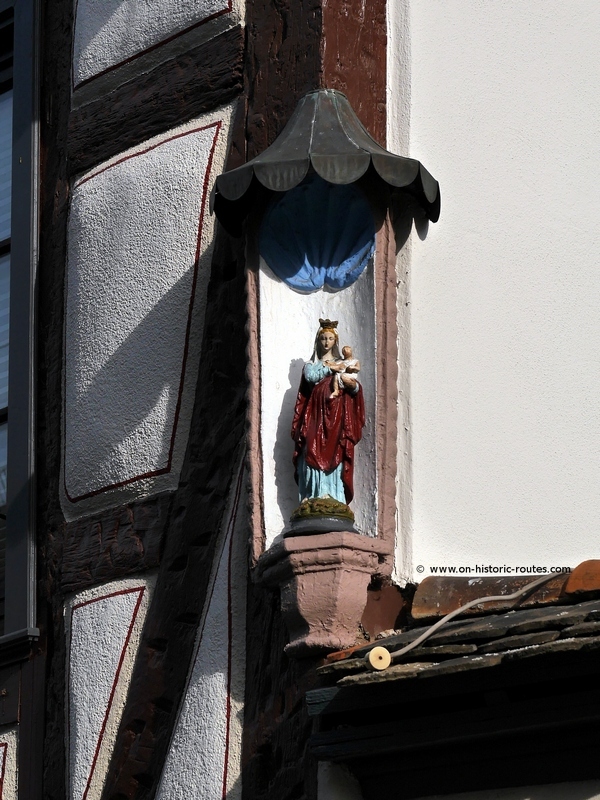 Detail on a half-timbered house along the route. A recurring theme of the walk became the statues of St John of Nepomuk on small bridges along the way. A number of small creeks cross the old road and there are statues of the patron saint on several of them. This is one the the things I never noticed before driving my car along that road. 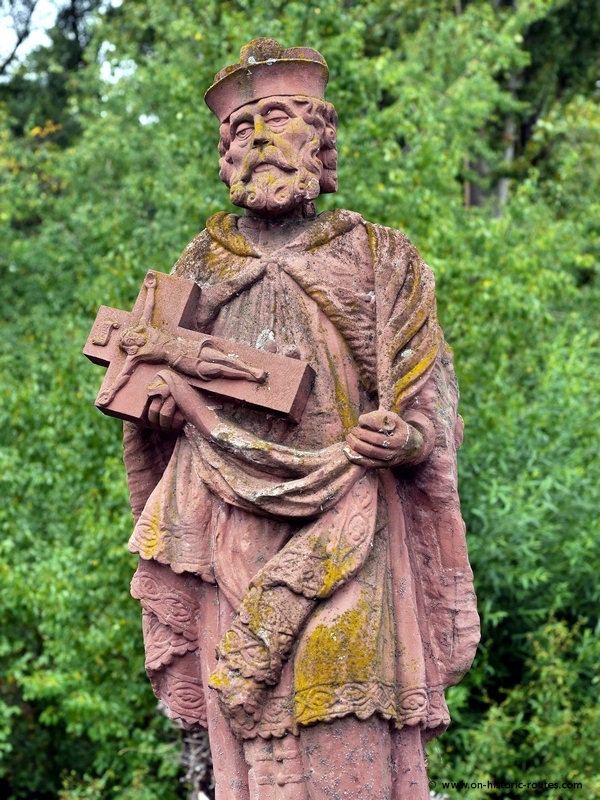 St John of Nepomuk guards a small bridge along the way. Another discovery was the old boundary stone that sits on a wall in the middle of vineyards. Until 100 years ago this was the border between Prussia and Hesse. As a result of the Second World War, the borders between the German states shifted but this old stone still stand next to the road. 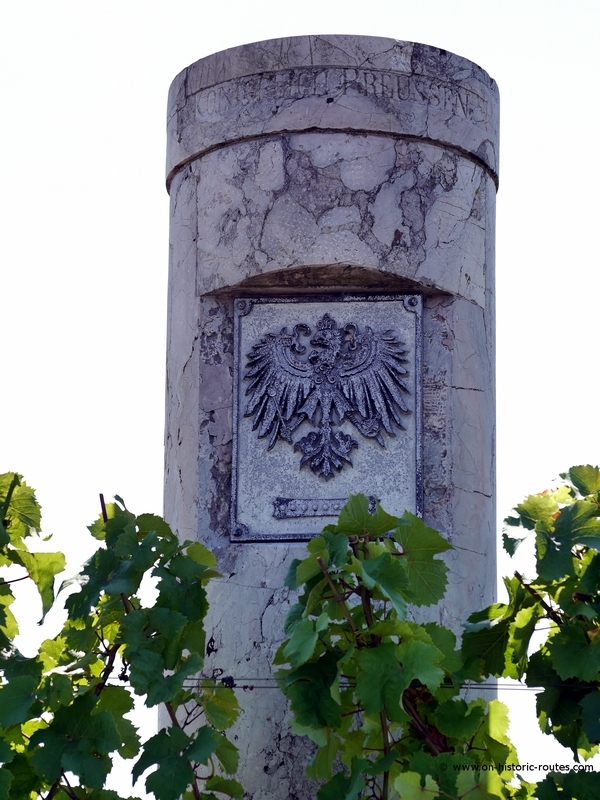 A Prussian eagle and a faint ‘Konigreich Preussen’ at the top indicate an old boundary stone in the vineyards. A somewhat misleading monument to me was the eagle that sits on top of a ten meter high Greek-style column. I thought it is one of the many war memorials that you can find in Germany. 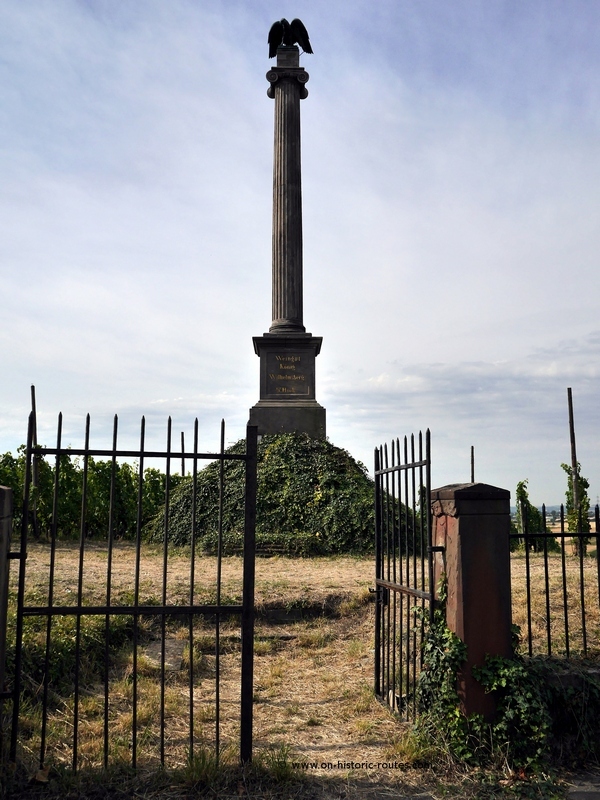 However, this monument in the small hamlet of Wicker is a decoration to a vineyard. Wilhelm I, Emperor of Germany, allowed a winemaker from Wicker to name his vineyard after him – König Wilhelmsberg or King Willam Hill. To honor both, the occasion and the Emperor, this impressive monument was commissioned in 1875. Monument to a vineyard and an Emperor. 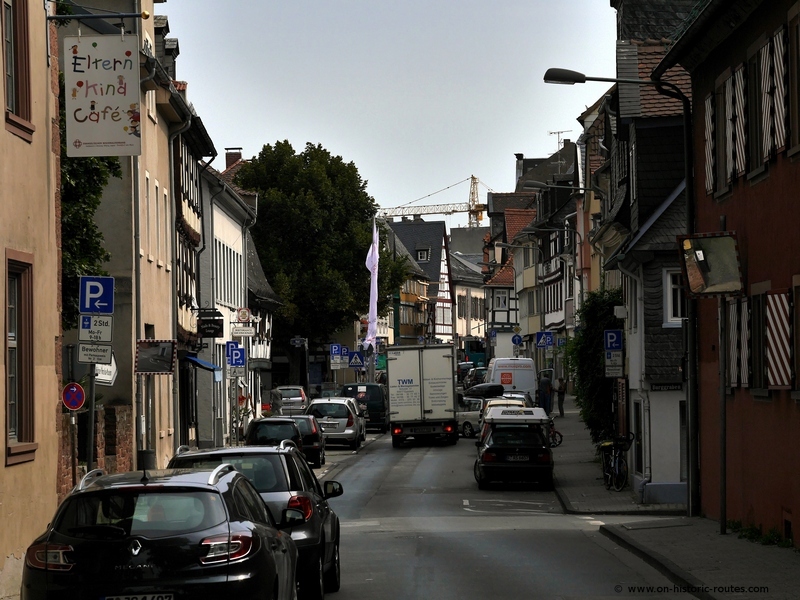 The old town of Hoechst is less known than the company that was named after it. The Hoechst AG was one of the largest chemical and pharmaceutical companies in Germany until it was ‘restructured’ in the 1990s. Its main production site however still is in use by the successor companies and lies just West of the old town of Hoechst. It is one of the largest industrial sites in Germany with an area of about 2.5 by 2.5 kilometers. 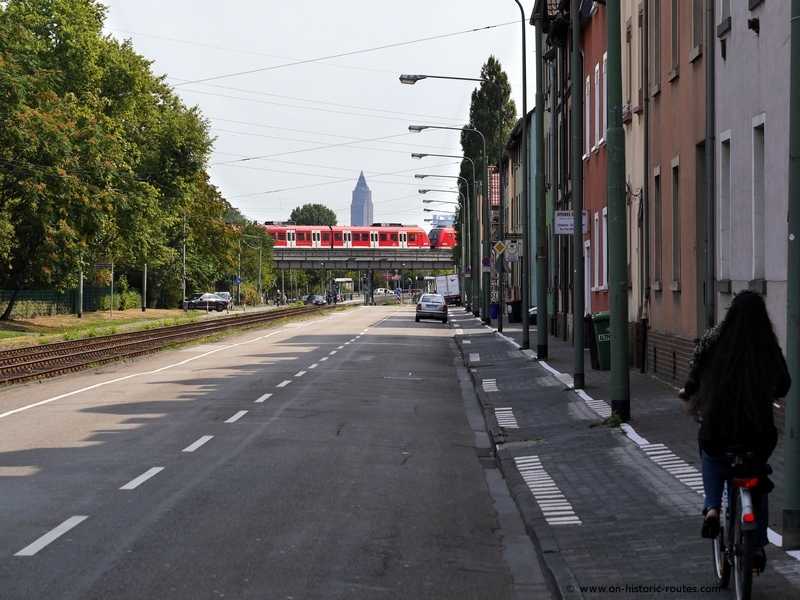 Originally, it was built on the old Mainz to Frankfurt route and the road still ran across the site until it was closed off to public traffic in the 1950s. The historic Mainz to Frankfurt route in Hoechst today. While there are some parts of the old route that changed over time due to railroad lines and modern road construction, the stretch through the Hoechst production site is the only one that is inaccessible today. You probably would not expect that the old town of Hoechst is worth seeing, since it is only 300 m from a huge industrial complex. This however, would be quite misleading. Lots of half-timered houses, an old castle and a quite riverfront on the Main offer a lot. The castle square in Hoechst. While Hoechst was a self-governed town rivaling Frankfurt for centuries, today it is a Frankfurt neighborhood. 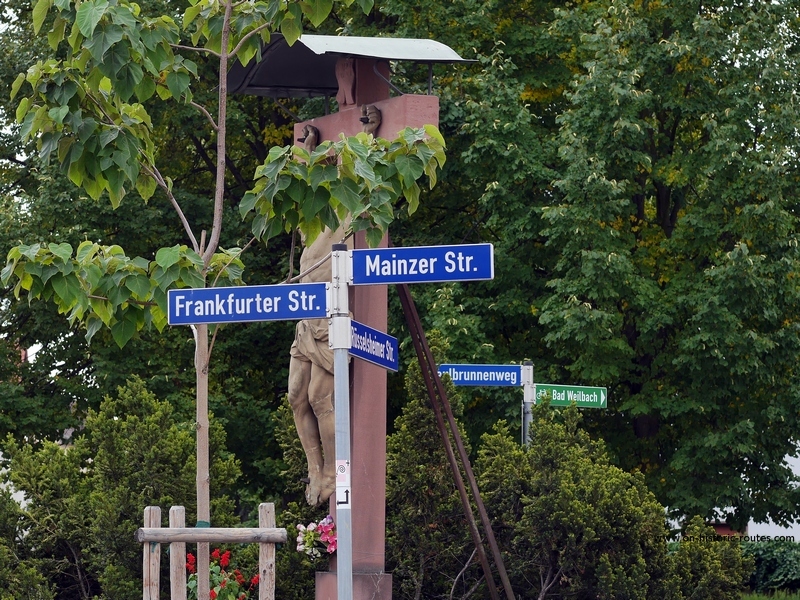 The remaining kilometers to reach the center of Frankfurt are more or less endless suburban roads with a mix of residential and commercial buildings along what is still called the Mainzer Landstraße or Mainz road. Approaching Frankfurt on the Mainzer Landstrasse.